Start here for planning your least privilege management strategy. 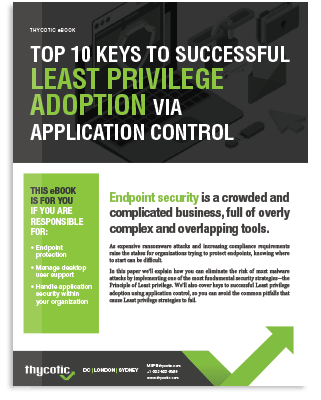 Improve security with least privilege: Reduce unnecessary high privileges, block malware, and meet compliance requirements. Discover local admin accounts, service accounts, and applications in use on endpoints with this FREE Least Privilege Discovery Tool for Windows from Thycotic. 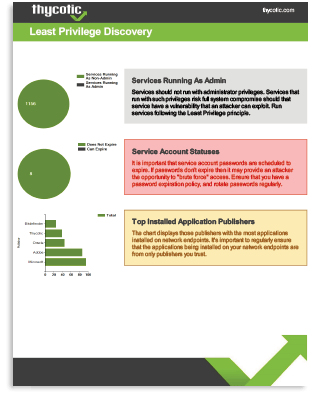 Find out which endpoints and local users have admin rights. Find all accounts with local admin privileges and applications that require admin rights. Implementing and enforcing a least privileged security posture takes planning, collaboration, and tools that make life easier for Security, IT Ops, Desktop Support, and users. Demonstrates how you can implement a least privilege strategy to protect confidential data, block malware, and meet compliance requirements, without slowing down users or requiring additional desktop support. Proactive protection for endpoints, the entry point for 85% of all data breaches. by removing local administrative rights from endpoints.